All your Wrath of the Lich King Pet Battle Needs fulfilled! on 8 hours it find valkry 5 time( I see record), but it kill valkry 5 time no to Capture he and help me Capture Tundra Penguin ? The current logic is to capture the last one still live pet ? Capture mode always goes for the pet first, for which it is running the profile. So if you don't have a Val'kyr and have "Always Capture Missing Pets" active, it will try and capture it. Afterwards it will only capture a Val'kyr it it meets your "Minimum Capture Quality". If you have set it to rare and the Val'kyr is only uncommon, it will not capture the Val'kyr, but look at the other pets. Without a log I don't know which pets you encountered and what your options are so I can't really say more than that. Sorry. The exception is caused by the Plugin Window of Honorbuddy. It is not related to Studio Companion. I get the feeling that there are some bigger problems with HB reading from WoW. But sadly that is not something I can fix. It is a core problem. And it has gotten worse and worse over the last couple of HB updates. no problem, i guess everything is working as expected, it was just me being blind! is there a easy way to filter what pets are missing in order to meet the requirements for the quests? Comes with the next update. I did not have time to finish it before the pet battle event. Version 1.0.160727.1 has been submitted to the store and is now awaiting approval. 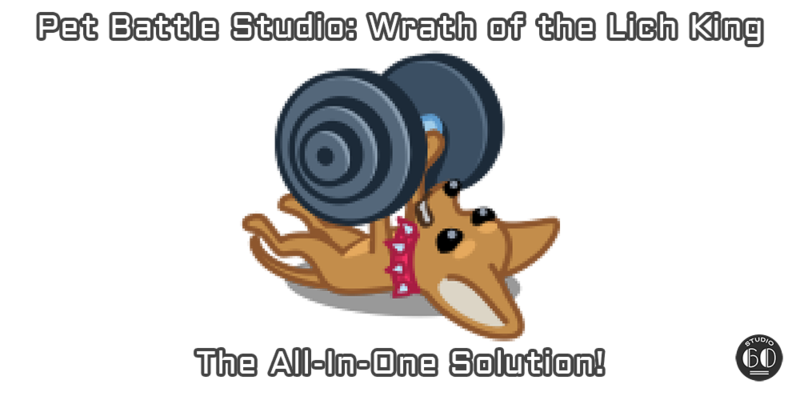 Version 1.0.161213.1 of Pet Battle Studio: Wrath of the Lich King has been submitted to the store. The changes will become available once the update has been approved.